I’ve been searching for a way to organize my magazines and newspapers. I was tired of my magazines and newspapers laying on my kitchen counter and coffee table. 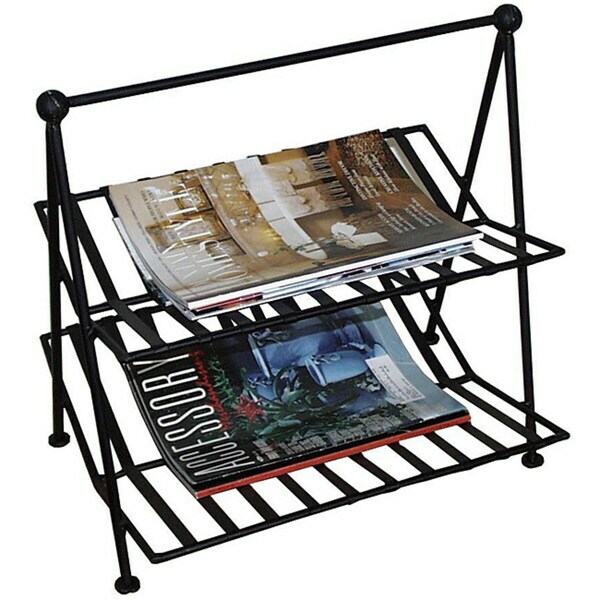 This black wrought iron magazine rack is perfect. It looks great in my family room and it’s currently holding 25 magazines! It’s sturdy and looks great! I absolutely LOVE the black wrought iron magazine stand! It is solid and well built, attractive, and serves the organizational purpose I purchased it for. Keeps messy neighborhood newspapers organized until I am ready to read them and has plenty of room for magazines on the top shelf. Absolutely perfect! It turns out to be smaller than I expected, taking up less floor space, which is a bonus! Highly recommend! This magazine rack has a great look so it's both functional and decorative. What I like best is that the magazines lay flat on the two shelves so they stay nice if you intend to keep them or even if you are just waiting for the chance to read them. This is in contrast to most racks that require magazines to stand or lean vertically so they inevitably shift to the bottom of the rack and/or roll up. I haven't done a great deal of pricing re magazine racks these days so the price seemed a bit high to me but I'm very happy with the style and quality of this piece. This magazine rack holds a LOT of publications in a small amount of space. I highly recommend it. Very happy with my iron magazine rack! I love the fact that it has 2 shelves that are flat enough to hold newspapers and magazine! Very stylish and a great way to display magazines! I have it in a spare bedroom and it looks great! This magazine rack was exactly what we were looking for. It is a nice sturdy design and it holds a nice amount of magazines. Exactly as pictured and nothing to assemble! I like the style, seems sturdy. Looks good with the furniture I have in the room. Very sleek. Heavy. Good buy. Nice, well made at a reasonable price. 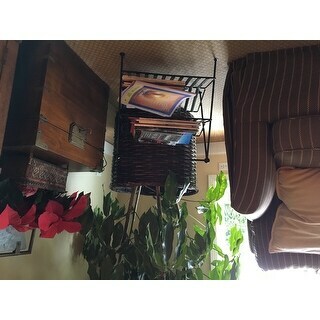 However, the height is not ideal if you are trying to get your magazine while standing up, for it is on the low side. This looks light in this picture but it is quite sturdy and heavy.. good quality construction. "Can you provide exact measurements of bottom shelf? Thank you. " Only place I could find the style I am looking for. i need a magazine rack.